This dollhouse kit reminds me of the old school type of dollhouses found in 1950’s and 60’s magazines. The removable roof allows one to access and decorate the interior of the structure. I’m not a fan of looking down to decorate or enjoy a miniature scene. 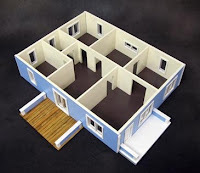 The smaller ½ scale is probably good for someone who lacks space to have a 1:12 contemporary dollhouse.